We all know that sports equipment often has a sweet spot. A baseball bat, tennis racket or skis are good examples of sports equipment with a sweet spot. If you make efficient use of the sweet spot, you maximize the response of the equipment. When you hit a baseball or softball with the sweet spot of the bat, the ball travels much farther than if the ball makes contact with another part of the bat. You have more control over the placement, velocity and spin of a tennis ball using the sweet spot of a tennis racket. The sweet spot of downhill skis are probably most like the blow hole of a flute headjoint than any other sweet spot in sports. Skis for beginner and intermediate skiers generally have a larger sweet spot and therefore are more forgiving of a skier’s technical weaknesses, but you also sacrifice something in terms of finesse and control on the hill with the larger sweet spot. On the other hand, advanced skis have a narrow sweet spot that gives a lot of control in turns and with speed. However, you need to understand how your center of gravity works in tandem with the skis to benefit from the precise response. Yes, flute headjoints most definitely have a sweet spot. And like skis, beginning flute headjoints are more forgiving of inexperienced players. Professional headjoints tend to require more precise air direction and placement to maximize the response. If your students have windy tone and/or pitch problems, they simply haven’t learned how to direct the air to maximize the response of the headjoint’s sweet spot. We blow down at about a 45 degree angle at the blowing edge, not really across the blow hole at all, as is so commonly believed. Most flute players are directing the air slightly to their right at the blowing edge. Headjoints are cut in such a way to allow for this. The exception to this is someone with a teardrop top lip who plays off to the right of the teardrop, rather than the more common left of the teardrop. How do you know if someone has hit the sweet spot? The sound is focused, full, round, in tune, has depth and resonance. Rest the inner edge of the blow hole approximately where chin skin and lip skin meet. Allow no more than 1/4 to 1/3 of the blow hole be covered by the bottom lip. Reach over slightly with the top lip to angle the air down at the blowing edge. Because there are so many variables involved in flute embouchure, there are an infinite number of problems that students can manifest in their tone quality and intonation. And as instructors it might seem we have to virtually be psychic to deduce the problem and offer solutions to our students. This is because so much is affected by things going on in the body that aren’t obvious from looking at a kid. Over the years I’ve been collecting a laundry list, so to speak, of tone/intonation problems and their solutions. Here are some common ones for beginner to intermediate students. Solution: The aperture is too large and the blowing angle is too shallow. Blow through a smaller aperture and angle the air down more. You can achieve a steeper blowing angle by putting the flute lower on the bottom lip and reaching over with the top lip more, while maintaining the smaller aperture. The Legend of Kiss and Roll, Independence for Lips! 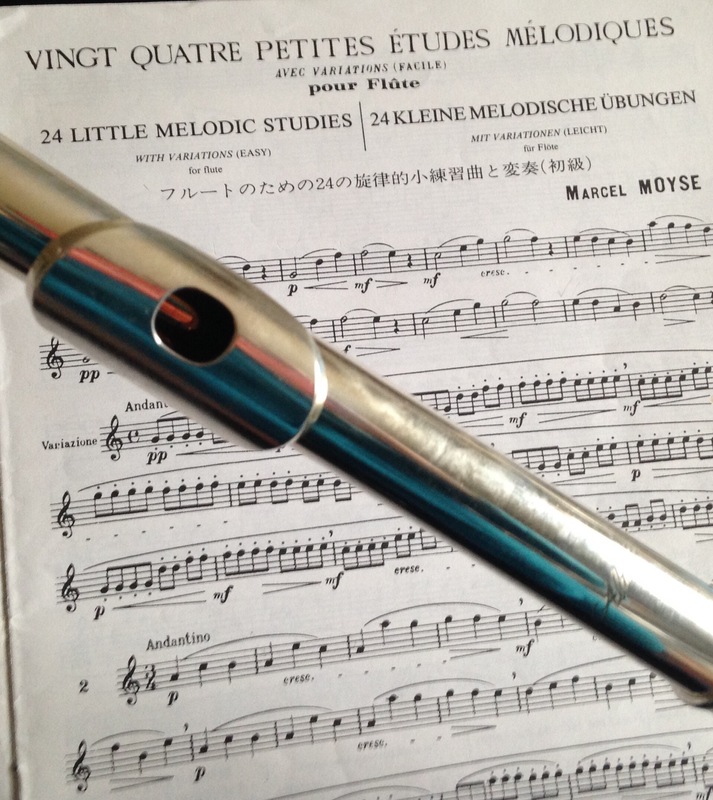 For yourself and your students, try starting out without a flute headjoint. Put an index finger under your lip and say, “what” or “water” a number of times. Then shorten it and say “waaaa”. Then just shape your lips for the “W” sound and blow through the resulting opening. Voila! Flute aperture 101.The next step is to shape your lips and tongue behind the teeth where gum and teeth meet on the top while blowing through the aperture, “too, too, too……”, keeping a steady air stream. Finally, go through the above process with a flute headjoint on your chin. Bring the flute up to the bottom lip from below to rest where the chin and lip meet. Adjust up a little for a very full bottom lip, adjust down for a thin bottom lip. Avoid the so-called kiss and roll because this puts the flute too high on the bottom lip for everyone. It’s a one size fits all solution that fits no one. The sound will be thin, light and probably sharp. Keep the blow hole open approximately two thirds. This is easier to do if the flute is a little lower on the chin than higher for most people. Having any more of the bottom lip in the blow hole than 1/3 will make a stuffy, dull and flat sound. The corners will take care of themselves, provided your lips are shaped as if to make the “W” sound. Really! Try for yourself. Roll your bottom lip (not the flute!) out a little to go up the octave or raise the pitch. Reach over a little with your top lip to play low notes or lower the pitch. The number one observation I hear from band directors about teaching flute is, “Flute is my weakest instrument.” This isn’t surprising because the major difference between other winds/brass and the flute is there isn’t a mouthpiece on the flute. It’s just a hole we relate to. There are seemly an infinite number of variables to learn to define relating to placement on the chin, blowing angle, blowing speed, shape of the lips, use of the lips and facial muscles. If all this is bewildering for you, the band instructor, to conceptualize, how much harder it becomes for you to try to explain flute embouchure to a kid. So let’s distill flute embouchure down to its basic elements. Come to the flute with an open mind, without preconception, if at all possible. Let go of whatever you know about embouchure on any other instrument, brass or reeds. To make a successful flute embouchure, you have to take it for itself, on its own terms. Bring the flute up to your chin from below. Let the inside edge of the blow hole rest where chin and lip meet. Adjust up for a fuller bottom lip or down for a thinner bottom lip. Experiment to find the place that gives the fullest sound. There simply isn’t a one size fits all solution to this one, just a general guideline. Shape the aperture with the middle of your lips. Imagine how your lips would wrap around a small straw or an oboe reed. It isn’t necessary to think about the corners at all. They will seal themselves. Pay attention to the size and shape of aperture you make with your lips. Direct the air up and down by rolling your bottom lip out a little to go higher, reaching over a little with your top lip to aim the air lower. Maintain the size and shape of the aperture regardless of register or dynamic. How you angle the air as described above determines register and controls pitch. You can control color and dynamics by adjusting the firmness of the edge of the aperture. Here are a few things you may tell your students about flute embouchure based on your reference as a brass or reed play that don’t work well: Kiss ‘n Roll, Tighter Higher-Looser Lower, Tight Corners, Warm Air/Cold Air, To Roll or Not to Roll. This is why it is so important to take flute for itself rather than trying to relate it to any other embouchure. All of these issues are a result of trying to fabricate a relationship between brass or reed embouchures and a flute embouchure. Remember, Our Lips are our Mouthpiece. The lips of a flutist have to do for us what everyone else’s mouthpieces do for them. If you find these entries useful, please subscribe, share with your colleagues and come back regularly. Feel free to comment. If you have a topic you would like to see explored more fully, you can contact me via IM/Messenger on Facebook or email me at dr_cate@sbcglobal.net. For information about clinics, workshops and performances, click here. Having strength and flexibility in the lips are the most necessary requirements for a good flute embouchure. If you have these, you can generate the necessary resistance to make a strong, characteristic tone. You can shape and direct the air to change register, correct pitch, and shade and color the tone. In most cases, a having a tear drop top lip will not prevent a student from developing a directed air stream. It’s just a matter of helping the student to learn to shape the aperture to one side or the other of the tear drop, though to the left (toward the crown) is generally more desirable. I have known students who have done either way successfully. However, occasionally there are sometimes cases with the shape or flexibility of the lips where it might be better to steer a student away from the flute because there is some physical limitation. Here’s an example from a parent’s comment left on the post “What do you do with your corners?“. My daughter is 12 and just learning the flute in band 7. She is having the toughest time getting the flute to make any noise. She has been told not to pucker her lips but isn’t puckering the shape you describe by sucking on a straw? She can only get a tone when puckering but having to blow really hard. She was also born with a cleft palate and after the repair as a baby her palate is shaped differently then a typical palate with a lot of bumps and creases. She also has a overbite. Would any of these issues be making it difficult to make her flute play? She has been trying for about a month with little improvement. Should we keep trying or switch instruments? You ask some really good questions. It is going to be difficult to diagnose and make recommendations for your daughter based on a written description. My guess is that because of her cleft palate repair, your daughter might have less flexibility in her top lip than is typical. This might be the cause of her having trouble shaping an aperture with her lips. Having an overbite shouldn’t be an issue. I have an overbite. In fact, I think an overbite might be an advantage to some degree. It’s hard to say for sure what is going on for this child, though, as I said in my reply, my best guess is that the cleft palate repair has left the girl with less than normal flexibility in her top lip. In this case, it might be a better choice to steer her toward another instrument, even a non-wind instrument. Having said that though, you will occasionally encounter a kid that is so determined to play flute, they will work at developing an embouchure with breathtaking perseverance despite what seems like an insurmountable physical obstacle. In that case I say let them work at it (with proper guidance) and decide for themselves whether they want to persist until they succeed or decide try another instrument. Once you have started your students on playing with vibrato and they are starting have some control over the speed of the vibrato, you will want to introduce other exercises to help with control of the speed and amplitude of the vibrato. After you students have learned to pulse the air column in eighth notes, triplets, sixteenth notes and sextuplets, introduce this exercise. This way they have to repeat each pair of notes at different speeds before going on to the next pair. This sample has only a few pairs, but be sure to continue up at least an octave. 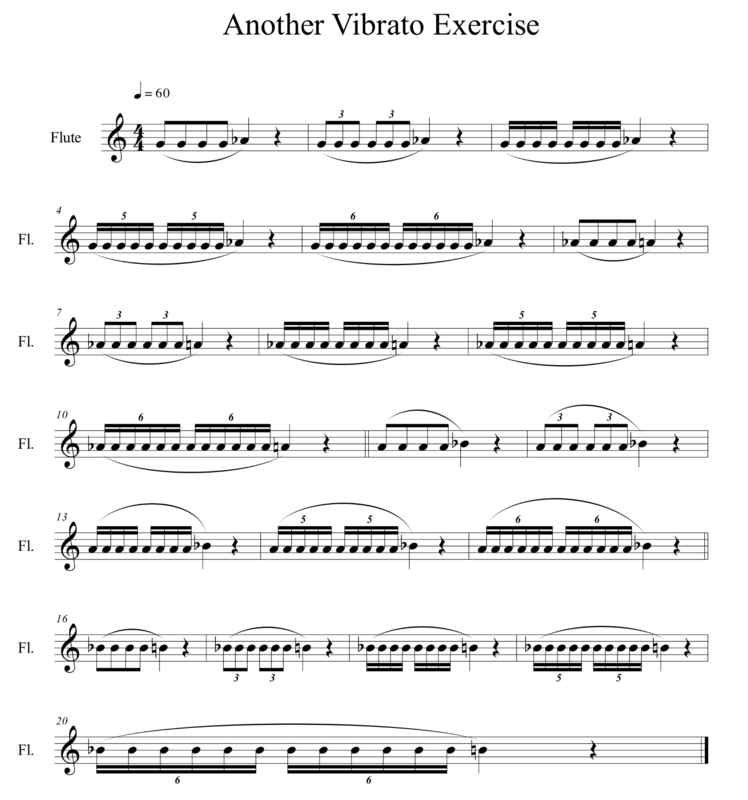 The choo-choo train exercise links the parts of the exercise above so students learn to accelerate and decelerate their vibrato within the span of one breath. Pick a low register note. Make sure to take a full breath. Over eight beats at mm=60, start out slowly, accelerate to around 6 pulses/beat and then decelerate to approximately eighth notes.The point is to seamlessly get faster and slower without a definite number of pulses per beat. Vibrato in the high register requires some extra effort beyond what it takes to incorporate vibrato in the low and middle register of the flute, especially at the fuller dynamic levels from mezzo-forte to fortissimo. Because of the higher frequency of the sound in the third octave, you have to engage the abdominal muscles more to make the vibrato noticeable. You could even say there is an additive quality to playing forte with vibrato in the third octave, meaning you have to physically push into the pulse from your abdominal muscles. This is different than lower on the flute, where you are letting up to generate the vibrato. The extra push is needed to widen the amplitude while maintaining a faster speed vibrato. If you don’t pulse with the abdominals, you will get an essentially straight tone. A light, shimmery vibrato for piano and pianissimo playing is created more similarly to vibrato in the other registers by letting up, very fast and with a shallow amplitude. You are going to want your more advanced students to learn to incorporate vibrato on sustained notes. In band literature, there are numerous examples of the entire flute section hanging on a pedal point in the middle of the texture or floating above the ensemble. You will want to have them play with more than just a steadily pulsing vibrato through the duration of the note. This isn’t very interesting for either the flute players or the audience, not to mention that is isn’t very musical. See if you can have your flutists vary the speed and amplitude of the vibrato through the duration of the note to match the phrasing in the other sections. That way the flutes can provide more support for the other sections and help the rest of the band shape their phrases with more sensitivity. It will also help your flute players feel like they are making more of a contribution how the entire ensemble sounds. If you play a brass or reed instrument, there is a certain kind of consistency built into how you blow into the instrument by the mouthpiece itself. The internal dimensions and type of material of the mouthpiece play a huge part in determining tone quality on the instrument. The reason why there are so many kinds of mouthpieces for any given instrument is because we, ourselves are so variable….in terms of lip size, teeth size and shape, tongue size, and size and shape of the oral cavity and internal dimensions of our throat. And it is also partially why there is constant research and experimentation in the design of mouthpieces (another reason being because tastes in tone quality change with time). Brass and reed players are aiming at producing a characteristic and consistent tone for their instrument, as well as improving response and flexibility. If you want to improve the tone quality, try other mouthpieces. The big difference with the flute is the player has to relate to a hole. It’s rather like having kids. As you well know, kids don’t come with directions. “Congratulations! You are a new parent. Go!” Nobody can tell you exactly how to relate to that hole. And yet flute players need to develop a consistency of approach with how the flute rests on the chin/bottom lip and maintaining the optimal distance between the aperture of the lips and the blowing edge (known as the transit time – the time from which the air exits the aperture to when it strikes the blowing edge). If you change it up by rolling in and out, you have no control of tone quality, tone color and intonation. Here’s the challenging thing about learning correct placement and blowing angle…Each flute player has to discover this best place for themselves because of all the other inconsistencies of lips, mouth, tongue, teeth and throat. It’s somewhat akin to learning a string instrument, except maybe a bit less daunting. With strings, every parameter of playing is up for grabs including placement of the bow between the bridge and fingerboard, bow angle, placement of the fingers on the fingerboard for correct pitch, bow speed and pressure. Or like trombone, where one needs hear the pitch to know where to correctly place the slide for the note to be in tune. With the flute, we need to learn consistency in order to maintain the correct blowing angle and have control over tone quality, intonation and color. Finally, I’d like to share a couple videos with you of flute players who know the importance of being consistent with maintaining the correct relationship with the blowing edge under extreme circumstances (i.e. while dancing). If these players didn’t understand this relationship as thoroughly as they do, they would not be able to maintain their beautiful tone throughout their performances. Here is Zara Lawler with Neil Parsons and Hilary Abigana of the Fourth Wall Ensemble. Be sure to check these out because you will see clearly that no matter what else they are doing, these players maintain the flute in relation their aperture at all times. There is no rolling in and out. If you find these entries useful, please subscribe, share with your colleagues and come back regularly for more flute tips. Feel free to comment. If you have a topic you would like to see explored more fully, you can contact me via IM/Messenger on Facebook or email me at dr_cate@sbcglobal.net. For information about clinics, workshops and performances, click here. There is no question that developing a wide dynamic palette and intelligent use of vibrato are essential skills for any aspiring flute player. Dynamics and vibrato add dimension and polish to the playing of individuals and within a flute section. However, I advocate waiting a bit before introducing these skills with your youngest players. Why? Because it is so critical for beginning flute players to master good embouchure and blowing skills first. Keep in mind that flutists don’t have a mouthpiece per se. We are relating to a simple hole that sits under our bottom lip. Our lips are our mouthpiece. Lips need to be trained to provide proper resistance, as we have discussed in other entries on this blog. And strong, supported blowing is an issue for any wind instrument beginner. Give your students the opportunity to solidify these skills before you introduce dynamics and vibrato. When you ask your flute students to play with dynamics before they have mastered the basics of blowing and embouchure, the consequences can be quite dire, even to the point of them quitting altogether. Short of quitting, kids get into all kinds of compensating behaviors in order to do what you are asking of them. The kids resort to various kinds of constriction of the air stream, all of which sound really bad. They include pinching or biting down on the aperture (think about the sound of letting the air out a balloon while stretching the opening of the balloon), clenching of the teeth (also a tight and constrained sound, in extreme cases can lead to TMJ problems), and closing the throat. Once kids form the habit of constricting the air to play more quietly, it is a huge task (and often unsuccessful) to convince them that there is a better way to control their dynamics by controlling the amount of air and the blowing angle. Kids are smart. If it sounds bad and feels bad (which is how any kind of constriction feels), why continue? It is discouraging and frustrating for them. They will find other outlets for their creativity that are more rewarding. There are similar problems that occur when you try to start kids playing with vibrato too soon. It has been shown that flute vibrato emanates from the epiglottis, the flap of tissue that blocks our wind pipe for us to swallow. It pulses but doesn’t completely close off the wind pipe when we play the flute. Again, it is absolutely essential for a student to develop a strong, steady, supported air column before introducing vibrato. If they don’t, the vibrato will be the most noticeable thing about their tone and it will not be possible to control the speed or amplitude of the pulse. Too heavy a vibrato is definitely worse than playing with a straight but supported air column. Teaching vibrato too soon is also a distraction and discouragement to ever learning steady blowing. Why set kids up for failure and disappointment? Teach your students to blow and how to develop a flexible, sensitive embouchure first. This can take a year to two years of playing. Then adding in dynamic control and vibrato is a relatively simple job. In fact, there’s a good chance that these skills will just magically appear in your flute players if they are well grounded in the basics of sound production and musical phrasing. Frankly, I have been puzzled why the Kiss-n-Roll approach to flute embouchure is still a thing among school music educators. There is so much information available, flutists teaching flute methods classes and so many flutists who care deeply about how students learn flute embouchure discussing how to correctly teach students how to relate to the flute that it seems amazing that the Kiss-n-Roll is still around at all. People like Patricia George, Phyllis Avidan Louke and Jennifer Cluff have written and blogged about teaching basic flute embouchure. On this blog, I’ve written on this very topic at least three times in the year and a half I’ve been doing it. Then last weekend, I had a very interesting insight into the pervasiveness of this phenomenon. While I was up in Wisconsin doing clinics and presenting at a flute festival, I had an enlightening discussion with a band director at one of the schools. His main instrument is trombone. He showed me what he understands about teaching flute embouchure. When he demonstrated, he rolled the flute down from the middle of his lips and made a sound typical of a beginner to intermediate flute player. I asked where he had learned the Kiss-n-Roll. He said he thought no one in particular had told him to do it that way, it just seemed the easiest way to relate to the flute. And that is when the lights went on for me. He is trying to relate to the flute lip plate the way he knows how to relate to his trombone mouthpiece! Doing this makes the flute seem less foreign, more familiar to what he already knows and can do well. Here is the harsh reality, folks. 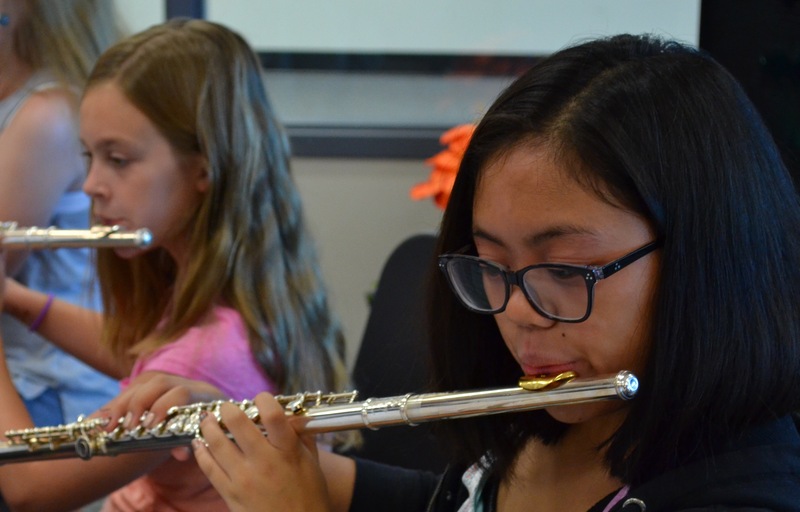 Rolling the flute down on the lip into playing position is never going to help your students develop a truly characteristic flute tone. Why? Because it places the flute too high on your lip to get the maximum resonance out of the instrument. The transit time (time from when the air exits your lips to when it hits the strike edge of the embouchure hole) is too short. The sound will always be small, often windy, sharp and unfocused. So what happened when I asked the band director to try bringing the flute up into position from underneath as I’ve discussed numerous times on this blog? Bingo! He instantly had a stronger, more focused flute sound than I think he had ever achieved in the past. Granted, it took him out of his comfort zone as far as how to relate to the flute. The difference in the sound he made was a huge improvement. Parting words for today? You cannot relate to the flute embouchure plate in the same way you relate to your brass mouthpiece. There is not going to be direct contact with your lips. Bring the flute up from below and learn to feel the inside edge of the embouchure hole about where your lip and chin meet (this can vary with the size and thickness of your lips). In order to get the best sound out of a flute, you need to let go of your attachment to the feeling of having contact with the middle of your lips. When you understand this and can explain this to your students, you will see a huge difference in the tone quality your students can achieve. The flute is a completely different animal from any other winds or brass. To achieve a characteristic tone, it is necessary to learn to relate to the flute on its own terms. Very frequently when I’m doing clinics, I ask flute students the difference between blowing a note in the low register versus blowing a second or third octave note. They will report to me that they were told by their band teacher to blow warm air for low notes and cold air for high notes. I’ve been pondering the veracity of that assertion for a while now. Initially it seemed to me like it could be a good way to conceptualize the difference between the registers. However, the more I’ve mulled it over, the more problems I see both with the concept and with how it manifests in students’ playing. Let’s first look at how this concept is presented. If you open your mouth in an “O” shape and blow gently on your hand, the air hitting your hand is indeed warm. Then if you shape a flute sized aperture with your lips and blow at your hand, you will feel a much faster, concentrated, cooler air stream hitting your hand. So far so good. Seems like a good analogy until you actually put a flute on your face. If you blow on a flute with a large enough aperture to have a noticeably warmer temperature in the air stream, the low notes are guaranteed to be soft, unfocused, lacking projection and likely flat. If you know a flutist who can play with a strong, focused sound in every register, ask to examine the temperature of the air column while they play in different registers. I’m sure you will find there is no appreciable difference. What you will find is that they blow with a uniformly strong air column that varies in intensity according to dynamics, but maintains the speed of the air column regardless of dynamic. This is how the finest flutists can play with a strong, focused, projecting sound in the low register and can play an exquisitely soft high note with control. They know how to maintain the speed of the air column and change the direction of the air for different registers and for different dynamic levels. As always, playing with a strong, focused, characteristic flute sound is understanding how to change the direction of the air while maintaining the speed of the air column. The PneumoPro is an invaluable tool for visualizing this concept. Another demonstration you can do with your students is to have them pair off. One student plays and the other holds their hand close to the face of the other student and reports whether the direction of the air is changing and whether the air column feels concentrated or diffuse. You will find that kids pick up quickly the difference concentrating the air stream can make for their sound in all registers. Even your beginners will have a focused and characteristic sound if you teach them to always concentrate the air coumn and effect changes in register by changing the direction of the air. Now you know why I think the whole warm air, cold air analogy doesn’t have much value as way of conceptualizing register changes and dynamic control. It causes more problems than it solves for the students. If you find these entries useful, please subscribe, share with your colleagues and come back regularly for more flute tips. Feel free to comment. If you have a topic you would like to see explored more fully, you can contact me privately on Facebook or email me at dr_cate@sbcglobal.net. For information about clinics and workshops click here.